If you have elected to ‘quilt’ the front of your cover you should first spend just a little time ensuring that any stray bits of thread that are hanging from the back of your embroidery are well secured and then cut – otherwise when you apply the fusible fleece they will be pushed against the surface and could distort and therefore show through the main fabric, and the embroidery really shouldn’t be detracted from! Once the back of the embroidery is neatened, lay it face down on your ironing board. Make sure it is definitely face down as there is no going back from the next step. Next, take your fusible fleece and place it fusible side down on the back of your embroidery, centring it so that there is an even seam allowance at the top and sides of your embroidery, for ease of making up, later. Following the manufacturer’s instructions, fuse the fleece to reverse of your embroidery, making sure your iron is on the correct setting and paying good attention as to whether the iron’s steam function should be on. That seems very specific and like I might be speaking from experience, doesn’t it… Ahem! 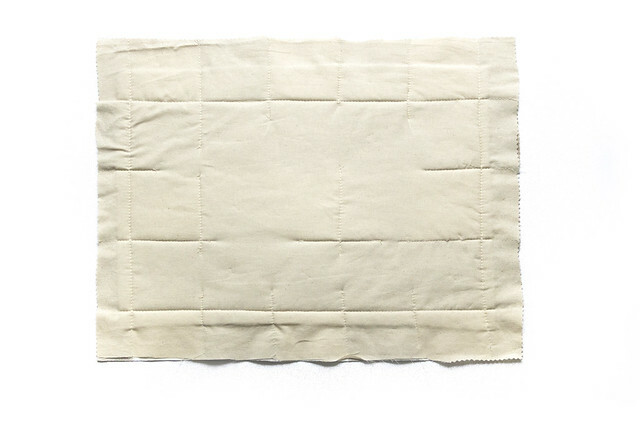 Once your fleece is applied and thoroughly cooled down, lay your piece of lining fabric on the back, square all the pieces up and turn the whole piece over. The reason, up until now, that I have often put the word ‘quilt’ into inverted commas like that is because I don’t really know or understand the first thing about quilting. I have not read a single page of a book or website on the subject. I did say that this was very much a beginner’s project, so let’s not get too hung up on those details. As I used a large checked piece of fabric I already had the lines on the fabric as provided by the design. If you do not have similar you can now draw some on using a disappearing ink pen made specifically for dressmaking. These are inexpensive and I find mine absolutely invaluable. To help ensure my layers all stay neatly aligned, secure through each of the squares of the checkered fabric or lines that have now been drawn . The pieces should be secured at regular, close intervals to help the layers stay aligned. The layers can be secured with dressmaker’s pins, safety pins or tacks of contrasting coloured thread to remove later – whichever is your preference. Keep the pins safely between the quilting lines as the aim is to complete the quilting without having to remove them at any point before completion. 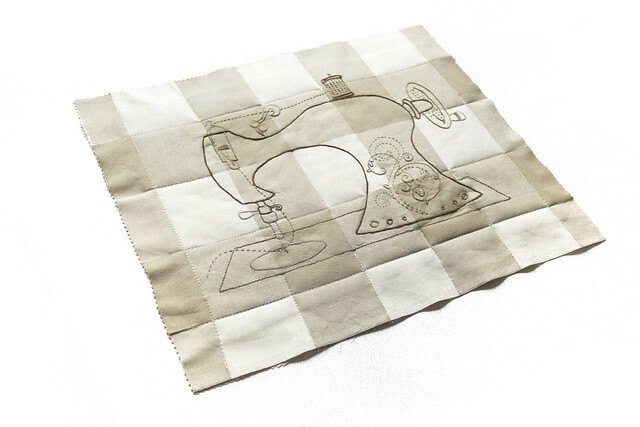 Once all layers are secured, begin sewing the quilting lines using a long straight stitch of 3.5-4mm. I decided not to sew over the embroidered design, so started at the edge of the pice of embroidery and quilted my lines outwards towards the edge of the fabric. I started at the centre line, quilting lines either side until I had sewn the outermost lines, then flipped the piece around and did the same with the horizontal rows of squares. For every row of stitches I left a tail of thread 15cm at the beginning and end of the stitching to neatly secure later. After no time at all the quilting pays off with a finished piece of soft and padded embroidery. To neaten the tails of any thread near the centre of the work I used a regular sewing needle to pass any thread that remained on the public side of the piece through to the back at an inconspicuous point along one of the already existing stitch holes and then worked the thread in on the reverse side. In the interest of full disclosure, the back of my quilted piece looks like this. The final stage is to piece the Sewing machine cover together. To d this take the long narrow piece you have cut and begin pinning with right sides together up one side, across the top and back down the other side of your quilted piece, and sew with a 1.5cm seam allowance. Do the same with the piece of fabric for the back, ensuring that the right sides of the long strip and the back piece are pinned together before sewing. 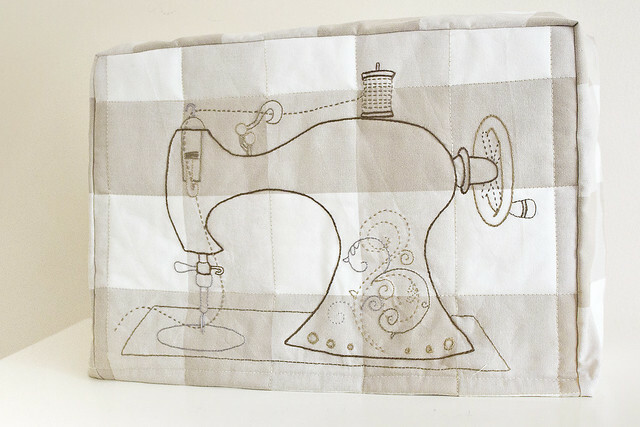 Once you have something resembling your sewing machine cover, neaten all your steams to prevent fraying and unnecessary strain on the seams by either zig-zag stitching the raw edge and trimming, using pinking shears if your fabric is less prone to fraying, binding with bias tape or any other method that you choose to finish seams with. Next you’ll want to give your cover a quick press to help shape it to its best. Once it’s looking neat and prim, pop it on your machine and lightly mark in a disappearing ink pen or with a few pins exactly the point at where the cover meets the table or surface that your machine is resting on. If you have an extremely large amount of fabric here you can trim away some excess to make your turned hem a little narrower, but the aim is to hem the cover so that it rests perfectly and neatly on the table. The stiffness provided by the quilting should help the front to almost ‘stand up’ to show off your embroidery work to its best, so use that to determine a nice, straight line. Once you have the hem length established, turn under twice to the back of the fabric and secure with a row of stitching to finish neatly. 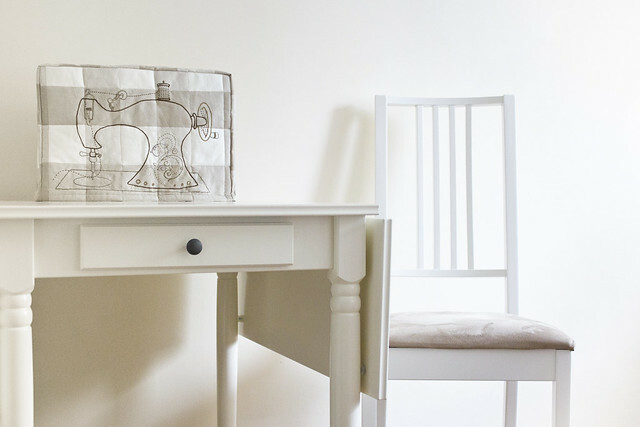 Give the cover a final light press and pop on to your sewing machine to admire your handiwork. A sewing machine cover will not only improve the look of a machine that doesn’t quite fit into its surroundings (obviously not an issue if you have a beautifully ornate machine or just love the aesthetics of the one that you have) but will also help to protect from dust and the effect of sun on some plastics, which as reader JodieBodie has mentioned can be quite damaging to the plastic of some sewing machines causing both discolouration and drying/weakening of the plastic. Arguably this is more of a consideration of the hot Australian sun that she has to contend with than it is here in the rainy Wast Midlands, but over an extended period of time UV light can cause damage to plastics at any intensity, so your new Sewing Machine Cover will be both practical and stylish: just like you. Hello, Eskimimi! I just nominated you for the One Lovely Blog award. You can read more about it on my blog, http://missjulietpoe.wordpress.com/2014/09/30/one-lovely-blog-award/ Have a wonderful day!